I hear you can get arrested if you dare to defend yourself from them, in these Snowflake, PC days. So, do you carry a stick - or a few hotdog sausages? There's SURELY a solution to this problem (ain't there?). How savage can they be? Perhaps it's your confidence they sense. Maybe I exude an aura which makes me appear to be a postman (or a meal on legs). Like you, i used to walk with impunity but on one occasion I was with my daughter when a particularly large and aggressive brute menaced us. I think he reacted to her fear and despite my equally aggressive response towards him, actually carried through his attack and I was bitten a few times, quite severely before its owner arrived and brought him back under control. Since then, I guess my nervousness is sensed by the beasts and I have even been attacked whilst driving a motorbike and even , on more than one occasion, returning home in a tuk-tuk FFS. the vast majority of soi and beach dogs I come across are usually all bark and no bite...and they will calm once they get near you provided you stand still and say a few kind words (I do it in Thai..no idea if that helps...I thinks it's just the timbre and easiness of the voice I use)..
Well I was pretty on high alert with my dog..........I'd be on triple alert if I was with my small child, for sure! Just realizing many of these soi dogs carry rabies may deter you a bit..
Nomad and Hatari like this. Cycling, chased but not bitten; times I've stopped and walked when there's been enough of them that I felt it was too risky to keep pedalling. My preference for riding in the hottest hours helps, 10am to 3pm they'll often be dozing in the shade, or a half-hearted bark. 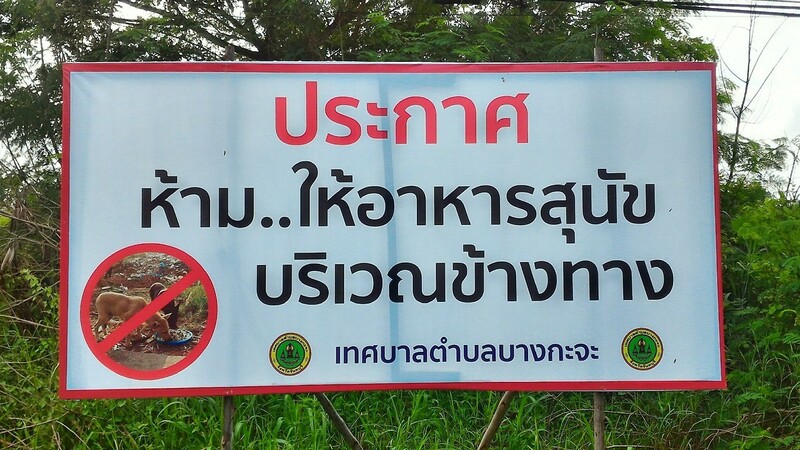 Areas we don't cycle though, rubber plantations and orchards will have what are basically guard dogs roaming, just don't go there. There's a Chinese cemetery set on a hillside I'm cautious about, sneaky dogs out from behind the gravestones, on the motorbike it's just the same, dogs coming in from both sides. Cycle group i regularly ride with, more dangerous at times if a dog gets in amongst the group; threat of throwing something, squirt with a water bottle, or a good shout usually works. Once a rider took an aerosol airhorn (as used to start races), dog was dazed but so were we, scrap that idea. Twice we've had dogs so intent on chasing cyclists that they were run over by cars, messy business the one that got caught under the front spoiler of a car. Cycle group i regularly ride with, more dangerous at times if a dog gets in amongst the group; threat of throwing something, squirt with a water bottle, or a good shout usually works. Once a rider took an aerosol airhorn (as used to start races), dog was dazed but so we're we, scrap that idea. Twice we've had dogs so intent on chasing cyclists that they were run over by cars, messy business the one that got caught under the front spoiler of a car. If I was in charge I'd have culling days whereby the local cops/army could ride around and just shoot any dog not behind a gate. I'd drive up and down the sois and just shoot the beasts, leaving their owners to clean up the mess. They'd soon get the message (the owners. not the dead dogs). You won't get arrested for defending yourself from an attack. I take the part Thai guy approach, terrorise. The full Thai guy approach is to terrorise, kill and eat them, and a lot of Thai's believe other dogs can smell that you have eaten dog before and don't mess with you. I have eaten dog before, not half a mile from where he lives, so that didn't work. Maybe I should order it rare instead of medium, next time. An old lady was attacked fairly badly in a nearby area, a group of the men in the area got together and went on culling spree of soi dogs. Shot, clubbed and hacked to death over 30 dogs in a rather small area. There are heaps of soi dogs around my area that no one owns as such but any that acts aggressive are quickly killed (often eaten also) the local community has zero tolerance for any aggressive dogs. Basically if a dog bites someone it will be killed by the locals. Yeah I don't think the science holds up personally 555, but it's what the locals guys believe. I think it's more to do with the terrorising and cruel things that they do to dogs that has more effect. Generally the dogs are ok with me. My only bad experience came when one chased me up a bridge in Bangkok at around 5am. I've seen plenty bark and snap at locals though. I read a thread over on TV where a guy was describing some dogs terrorising some locals on Koh Chang. Sounded pretty nasty. Quarky, PeteGill and bacwaan like this.